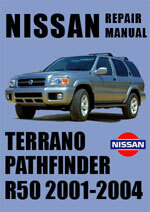 The information in this Workshop Repair Manual is suitable for the Nissan Pathfinder and Terrano vehicles manufactured between 2001-2004. The following is a list of information contained in this Repair Manual. All sections show how to remove, repair and replace the parts with full easy to follow descriptions and detailed diagrams.